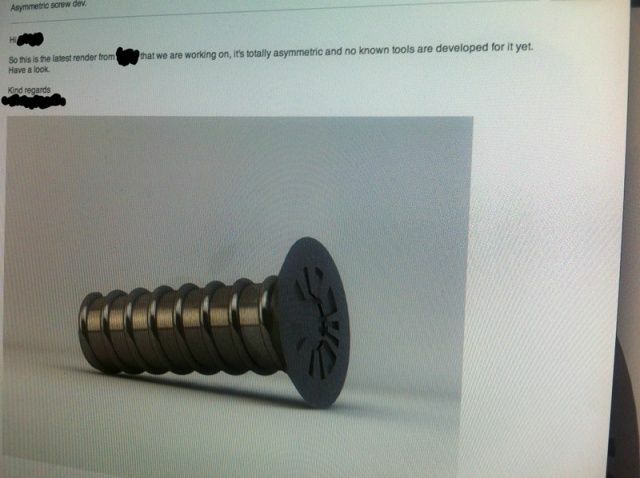 The”leaked” asymmetrical screw we reported on last week has turned out to be a fake, put forth as an experiment by a Swedish design company on how Apple rumors propagate themselves across the internet. As you might remember, the asymmetrical screw initially popped up on Reddit from a user with a throwaway account, claiming that it was being designed by a “certain fruit company.” At the time, we reported on it with a degree of healthy skepticism, and later spoke with iFixIt about the design of the screw, ultimately concluding that it was likely not legitimate because of torque issues. Most of the coverage of the story in the Mac space followed this tone. What the perpetrators of this hoax discovered, however, was that while most major news sources reported on the news with skepticism, the story was increasingly spread through social media networks as fact. “Critical thinking was vaporized” at this level, says Lukasz Lindell of Day4.se. Clearly was, the blogs and newspapers that reported on the screw all fell back on that this was a vague rumor, unconfirmed, but yet discussed what impact the screw could get for the Mac world if it was in use. However, we noticed a difference in the discussions from the readers. While the reporters did not agree fully with that this would happen, pointing out that this was a rumor, readers more clear in their view. Either they perceived the news as truth, or called it fake, no grey zone in between. The split between the two camps, was quite unequal. An estimate would be that 90% regarded the screw as a fact and based all the further opinion on that, only 10% were critical to accuracy. With each step further away from the source the perception that this would be true increased. On Reddit, where the original entry was made we see it as a 0 mode, the image was posted, nothing more or less. Newspapers and blogs that draws attention to the behavior (Yahoo, Macworld, Wired) takes it with a grain of salt, so the truth factor goes down a bit. The commentators to the articles takes it almost as 100% truth, raising the truth factor bar. The commentators / readers who spins it on in their own social media (Twitter, G +, Facebook) defines it as the truth, all doubt is gone. In what segment do you pick up your information, and wich one affects people the most? I think these guys are overlooking another factor: this experiment was about Apple, a notoriously secretive company. The fact that Apple keeps things so close to their breast results in a lot of mounting consumer interest in what Cupertino is releasing next, which is exactly what Apple wants: everyone waiting with bated breath for months for a peek of their next magical product. Unfortunately, there’s a flip side to that, which is that rumors don’t ever get affirmed or denied directly by Apple, which can in turn result in the viral spread of misinformation by the overly credulous, as happened here. It’s impossible to imagine this same experiment working with any other company, for just this reason. This was a great experiment by the guys at Day4. It’s a lesson not just to readers, but to those of us covering the Mac space: the louder the echo chamber gets, the less nuanced it’s going to be. Unless you hear it directly from Apple, every glimpse of upcoming products or projects needs to be handled with extreme skepticism.